South Korean Kim Hyo-joo has come up short in what could have been a historic rally to win the oldest major on the LPGA Tour. Kim lost to Ariya Jutanugarn in a playoff at the US Women's Open at Shoal Creek Golf and Country Club in Shoal Creek, Alabama, on Sunday (local time). The two ended the regulation tied at 11-under 277, before Jutanugarn sealed the victory on the fourth playoff hole with a par. Kim, world No. 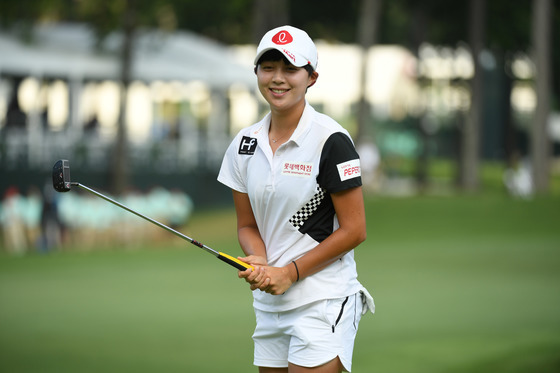 67, was six strokes back of the fifth-ranked Jutanugarn, the overnight leader, to start the final round, and fell back by as many as seven strokes during the final day. But Kim carded a bogey-free 67, while Jutanugarn had an up-and-down 73 that included a triple bogey at the 10th and back-to-back bogeys at the 17th and the 18th. Kim would have completed the largest final round comeback in the 72-year history of the US Women's Open. The record for the biggest final round deficit overcome is five strokes. Kim was searching for her first LPGA win since January 2016 and her second career major after the 2014 Evian Championship. In the final round, Jutanugarn went out in 32 thanks to five birdies and a bogey, putting her at 16-under, seven better than Kim, who had three birdies on her front nine. But then things began to unravel for Jutanugarn. She had a triple bogey at the 10th and made a bogey two holes later. Kim, playing in a group ahead, picked up a birdie at the 12th and the deficit shrank to just two strokes. Kim picked up another birdie at the 15th to reach 11-under, just one back of Jutanugarn with three to play. The Thai star gave herself some breathing room with a birdie at the par-3 16th that took her to 13-under. Kim missed her birdie opportunity at the 17th, but Jutanugarn found some trouble at the par-5 hole. She missed the green long with her third shot and botched a chip to leave herself with a lengthy par attempt. She missed it well left and had to drain a knee-knocking bogey putt just to stay one shot ahead of Kim with one hole to play. Kim made par at the 18th and watched from the scorer's tent as Jutanugarn put her second shot on the finishing hole in a greenside bunker. Jutanugarn was still well short of the hole after blasting one out of the sand and couldn't sink the par putt to clinch the title in regulation. The two players couldn't solve anything after a two-hole aggregate playoff, held at the 14th and 18th holes. Kim birdied the 14th to take the upper hand, while Jutanugarn made par. Kim only needed to match Jutanugarn's score at the 18th but committed a bogey after finding a bunker with her second shot, while Jutanugarn made par to extend the playoff. The playoff now became sudden death as the two went back to the 14th. Kim was on the green in two, while Jutanugarn pulled her second shot into a bunker, and both walked away with a par. They returned to the 18th hole for the third time Sunday. Both found bunkers with their second shots -- Kim short of the green and Jutanugarn just to the right -- and the South Korean finally blinked. She left her bunker shot well short and right of the cup and then watched Jutanugarn's third shot roll to within a tap-in range for a certain par.